I was born in Canada in 1943 and have never met my uncle Abram Wiebe. As a youngster, I heard about him frequently from my mother when she would tell me stories about her early life in Russia (now Ukraine). When I visited relatives, they would often look at me and comment on how much I looked like Uncle Abram. As a youngster I would probably roll my eyes and wish they would talk about something else. However something stayed with me and my Uncle Abram became part of my life and my memory. Abram Wiebe was born 11 January 1897 in Lichtenau (now Svyetlodolinskoye Ukraine). This is one of the Mennonite villages in the Molotschna settlement. Abram and his brother Nickolas remained in Russia in the fall of 1928 when his parents and 4 sisters (one of whom became my mother) emigrated to Canada. The brothers were denied exit visas as they were still of military age and potentially eligible for the draft. Details of his early life are sketchy. It is believed that he attended the School of Commerce (Kommerz Schule) in Halbstadt (now Molochansk Ukraine) as he worked as an accountant later in life. During World War I, he most likely worked in the Medical Corp. During the civil war he fought in the White Army under General Wrangel. On one occasion he came home on leave and in full White Army uniform walked into Lichtenau unaware that the village was occupied by the Red Army. His mother almost fainted when she saw her son standing in the doorway. He had not been seen by the Red Army even though soldiers were billeted in the front two rooms of his parents’ house. He spent four days hiding under a bed (some accounts say between the mattresses) in one of the backrooms of the house before he was able to slip away under cover of darkness. 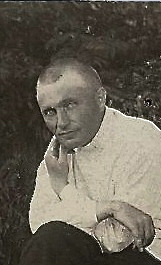 Abram Wiebe married a widow, Eugenie Schulz (nee Schweier) in the mid 1920's. Eugenie, of Lutheran background, came from one of the German colonist settlements west of the Molotschna River. She had one daughter from her previous marriage by the name of Elfie. Abram and Eugenie Wiebe never had children of their own. Abram Wiebe and his family received financial support from his sisters in Canada during the Ukraine famine (Holodomor) of the early 1930's. This enabled him to buy food and allowed his family to survive that catastrophe. The receipt of this assistance had the unfortunate consequence of attracting some unwanted attention. A man by the name of Pbgan (pronounced "Begun" with the accent on the second syllable) made some threats to Abram and forced him to provide the address of his sisters in Canada. Pbgan subsequently sent a letter to Canada demanding financial assistance for himself. He was known to the Wiebe family from the time of the revolution as he was directly responsible for the death of Aaron Wiebe, Abram's cousin. Pbgan had played an important role for the Communists in the Molotschna area during the revolution but must have fallen out of favour by the 1930's. Consequently, the Wiebe family remembered Pbgan when his threatening letter reached them in Canada. On the advice of Abram Wiebe, the sisters in Canada did not send any assistance to Pbgan. The Abram Wiebe family was living in Tokmak in 1937 when he was arrested by the Communist authorities. In the weeks preceding the arrest, Abram had grown increasingly apprehensive as many friends and acquaintances were being arrested. In his last evening at home, he had complained of a tooth ache and talked about seeing a dentist the next day. The arrest followed the usual procedure, starting with a loud knock on the door during the night. The house was searched and the arresting authorities found pictures and letters from his father and sisters in Canada. This was considered to be incriminating evidence. He was taken away after a false promise from the authorities that he would be returned in the morning. His step-daughter vividly remembers the fearful look on his face as he was taken away. Elfie and her mother were allowed to visit Abram several days after his arrest. He was being held in a jail in Halbstadt. It appeared that he had been beaten. In order for the guards to listen in on their conversation, they insisted that everyone speak Russian. Elfie stubbornly spoke in German and her step-father had to implore her to speak Russian as he told her that he would suffer the consequences if she did not comply. Abram's wife came to visit him again a few days later and discovered that he had been sent into exile. From what we can gather, Abram Wiebe was sent to a place where he worked in forestry. He wrote several letters home to his wife. His last letter stated that he had had an accident when a fully loaded wagon had run over his leg. The leg was broken and he was unable to work. The last sentence in the letter stated that "As you know, those who don't work can't eat". There is an unusual follow-up to this story. Sometime in the 1960's, our family heard a third-hand account from someone who had been exiled to a forestry camp in the Soviet Union and had survived and subsequently come to Canada. This source stated that during a move from one camp to another, he had seen a man sitting on the ground leaning against a tree. Something seemed amiss and as he approached the man, it became apparent that the person was dead and the body was frozen. A search of the body revealed some identification - it said "Abram Wiebe - Halbstadt". There is no way of confirming this story or determining that this Abram Wiebe was indeed my uncle. Starting in 2011, I have had the opportunity of spending time in Halbstadt (Molochansk) and volunteering at the Mennonite Centre, which provides humanitarian assistance to the areas where my ancestors once lived. This has given me the opportunity to visit the places where my uncle once lived. I have visited his home in Lichtenau where he was born and stopped and stared at the jail in Halbstadt where he was held after his arrest. I know that his remains are scattered somewhere in the forests of Siberia. The brick in this wall is his only memorial.